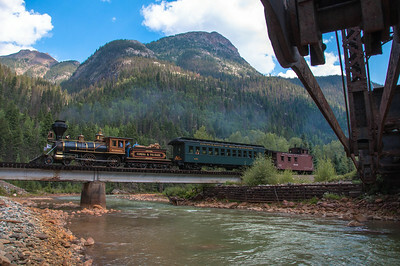 Due to the nature of my work as a locomotive engineer on the very last rung of the roster on a commuter line, my schedule is not usually conducive to making events such as the Durango & Silverton's Railfest. Usually, my week ends at 02:00am on Sunday Morning after an 8 to 10 hour shift, and running to Durango for a 09:45 departure is hard to make, even for a rare event such as this. Luck, or so I thought, was in the cards for the weekend as our annual rules exam was scheduled for that Saturday. Even with Company's Annual Picnic at the Albuquerque Isotopes baseball game, leaving the house at 05:00 would not be a problem. But that Thursday, a torrential rainstorm dropped a huge amount of water just to the East of Kewa Pueblo washing out a portion of the railroad tracks. In an effort to bring the track back up to standards, I received a call at 22:00 Friday evening asking if I could make it to work at in four hours to help finish the job of restoring the line. I ended up working a full 12 hours for the shift, and still decided to go to the ball game... getting home at 22:00 that night... Personal choice to wreck myself for that one though. Even with a lack of sleep for the weekend, and being woke up at 04:00 on Monday asking if I could somehow make it to work ASAP (until they found I was in Colorado) I was able to grab some of these timeless shots. Enjoy. * Update, in 2017, Dan had finished the work on the Eureka to make her FRA compliant once more, and now, the "last run" moniker assigned above is bunk. But until then, it remains as a anachronism. 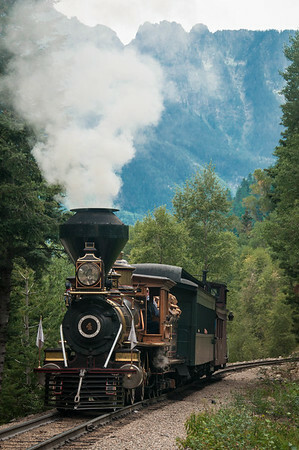 Video of the Monday run of the Eureka from Silverton to Tacoma. 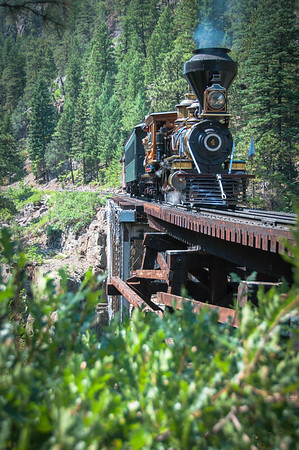 Durango and Silverton Railroad Employee George Swift is piloting the Eureka along the famous "High Line". 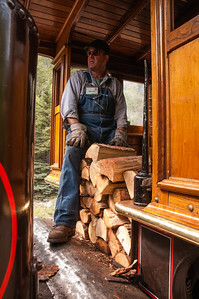 While the Engineer is the one actually operating the locomotive, the "Pilot" is an individual who is familiar with the railroad that the train is operating over, and can instruct the visiting engineer how to properly operate. 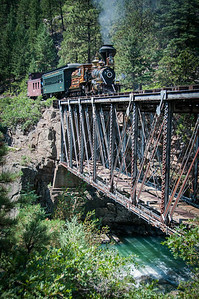 The High Bridge, Northward from Durango, this is the second time the railroad crosses the Animas River, and easily the most spectacular. 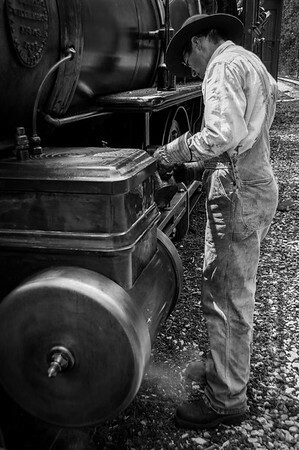 Volunteer Todd Moore is seen here oiling around the locomotive while the train is stopped at Tacoma. This task will be performed at each stop to make sure all the moving surfaces do not run dry and cause damage. 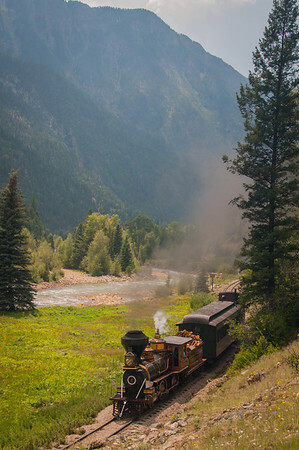 Needle Creek Canyon runby. 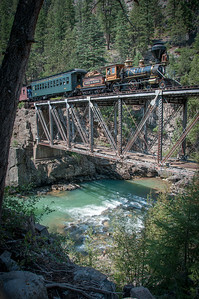 Above the train and the Animas River, a branch of the Needle Mountains run high above. 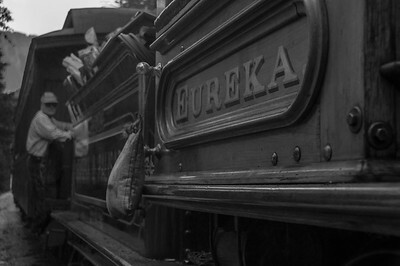 The Eureka is a wood burning steam locomotive, unlike its coal eating cousins that normally run this railroad. 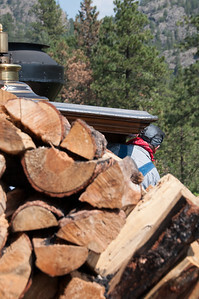 Also, unlike its counterparts here, needs to be fueled multiple times during the trip between Durango and Silverton. 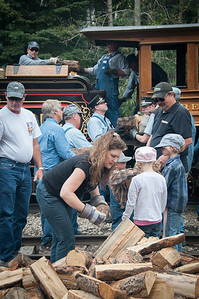 Here, the Eureka Volunteers, Train Crew, and even passengers get into the act of filling the tender with wood. ♫Take on some water at the Needleton Tank, and then struggle up a two-five grade...♫ -C.W. 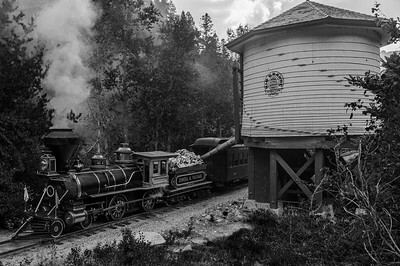 McCall, "The Silverton" Eureka is seen "taking on water" at the Needleton Tank. This tank in particular has not seen service in over forty years, and a replacement is just out of sight to the left. The replacement is nowhere near as photogenic as the original. Driver and Lower Cab Detail. The Eureka backs away from the Needleton Tank back towards the Needleton Siding just around the corner. The day is running long, and we can not afford to delay the regularly scheduled passenger trains. Eureka Volunteer Todd Moore and D&SNG Employee Tim Smith wipe the Eureka's rods while laying over in the Needleton Siding. Not only will they wipe down the rods, they'll clean the wheels, brass, and everything that gets dirty. 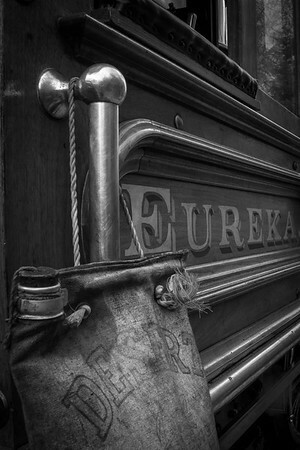 Much like the Locomotive Engineers of the 1870's, the Eureka crew is very proud of their locomotive. Volunteer Murray Moore sits in the fireman's seat in preparation for departure from Needleton. The fourth crossing of the Animas River from Durango is established at Elk Park. Originally the crossing of the river was done via a steel and wooden truss bridges here. 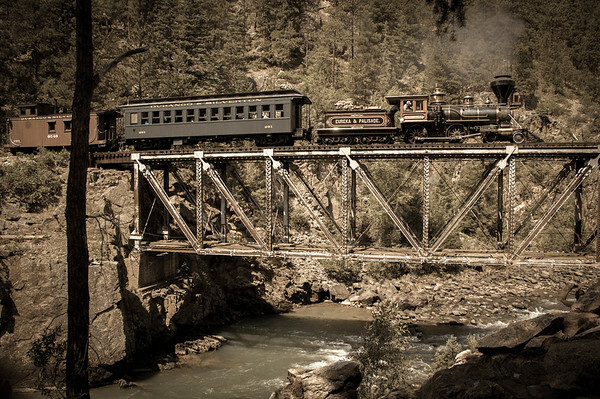 Weakened by the Spring flows of the Animas, the original crossing was abandoned in 1964. Our shot is taken from under the steel portion of the abandoned bridge, with the detail of the underside of the bridge dominating the upper righthand corner. While the "New" (New, but built nearly 45 years ago) bridge is "uninspiring", the view behind it make up for any little bit the bridge lacks. The view behind the Eureka and train is the Grenadier Range consisting of peaks such as Electric Peak and Mount Garfield. The fourth crossing of the Animas River from Durango is established at Elk Park. Originally the crossing of the river was done via a steel and wooden truss bridges here. 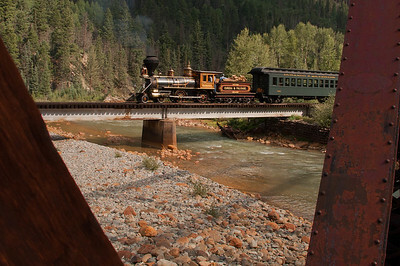 Weakened by the Spring flows of the Animas, the original crossing was abandoned in 1964. The shot here is taken from "track level" of the old bridge between the wooden and steel sections. 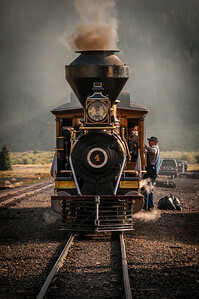 Arrival in Silverton... The Garbage is being thrown, the crew is removing their "grips" from the train, and the locomotive falls silent for the night.